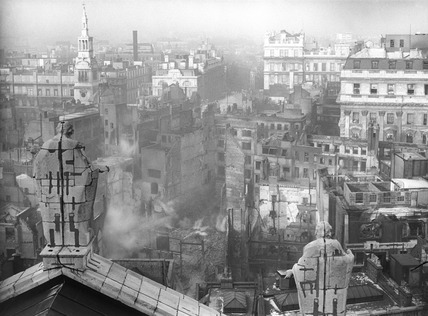 Bomb damage seen from St. Paul's cathedral towards Paternoster Row. In the aftermath of the Blitz on London, St Paul's stood almost solitary amongst the surrounding devastation. Diligent firewatchers in St Paul's had managed to contain each incendiary bomb that landed. On 16 April 1941 a bomb did penetrate the roof and exploded in the crypt. Police Constables Arthur Cross and Fred Tibbs were on the roof of St Paul's, looking out towards Paternoster Row, when they took this photo. The area was central to the publishing industry. Damage from incendiary bombs in one night alone resulted in 27 publishing firms, their warehouses, and an estimated 5 million books being destroyed.